The Surrey Hills Chamber Choir hosted their first concert independently from the Surrey Hills choirs and Impromptu with great success on Saturday 14th June 2008. Christ Church, Shamley Green was selected as the perfect venue with its beautiful building, charm, lovely acoustics and, above all, welcoming vibe. The vicar, Sally Davies, a great lover of music, was extremely enthusiastic and supportive of the concert and the church was bursting at the seams with audience. The choir were delighted to share the concert with two local artists, the Bartlett String Quartet, and also talented young violinist Madeleine Pickering. The contrast of string items alongside the choral items from the choir gave the concert a new dimension and a touch of class! 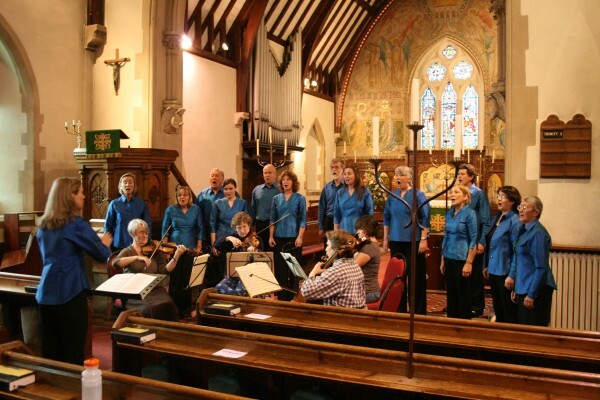 The choir performed a wide variety of songs, including early pieces by Viadana, contemporary items by Dove and Whitacre, as well as Folk Song and Spiritual arrangements and a large selection of popular songs and musicals. In the first half their winning competition piece “Into Thy Hands” by Jonathan Dove created a magical atmosphere, and their upbeat spiritual “Down by the Riverside” with soloist Christine Parrott surrounded by three finger-clicking basses, caused quite a stir with the audience! The Bartlett String Quartet closed the first half with a lovely performance of Hadyn’s String Quartet Opus 33, No3 “The Bird”. The Chamber Choir were delighted to be given the opportunity to perform with the string quartet and opened the second half with a performance of one of Mozart’s beautiful motets “Ave Verum”. Young violinist, Madeleine Pickering, followed with her official debut performance at a public concert with a performance of “Salut d’Amor” by Elgar and “Liebesfreud” by Fritz Kreisler. At the age of eleven, Madeleine is already attending the Primary course at the Royal Academy every Saturday and her amazing talent was a joy to behold. She clearly enjoyed the second piece as she had a smile on her face as she played. The concert concluded with a lighter selection of songs performed by the choir, including separate items from the ladies and the men. The ladies performed an atmospheric rendition of Sting’s “Fields of Gold”, whilst the men entertained us with the barbershop classic “My Evaline” and a humorous rendition of “The Jolly Farmer” – I don’t know how much they paid Darrol to wear that hat! !